It is composed of a myriad of low islands or "atolls", simple rings of coral crimped by green islets and enclosing gorgeous lagoons. Over the millennia , the very heavy high volcanic islands , which are the five archipelagos of French Polynesia , slowly sank under their own weight and suffered the erosion of wind and rain , while the coral reef surrounding increased. Thus, the deeper the island sank , the larger the lagoon widened. When there is no trace of the sunken volcano left , the island continues to exist in the form of an atoll , a coral ring surrounding the lagoon. Atolls, the emerged last stage of this evolution, are up to 10 million years old and are the oldest islands. Polynesia account numerous atolls (about 80 ) most of which are in the Tuamotu Archipelago . More or less circular-shaped, they have a sharp outer edge, beaten by the waves of the ocean, on which develops the coral structure that is behind the building. 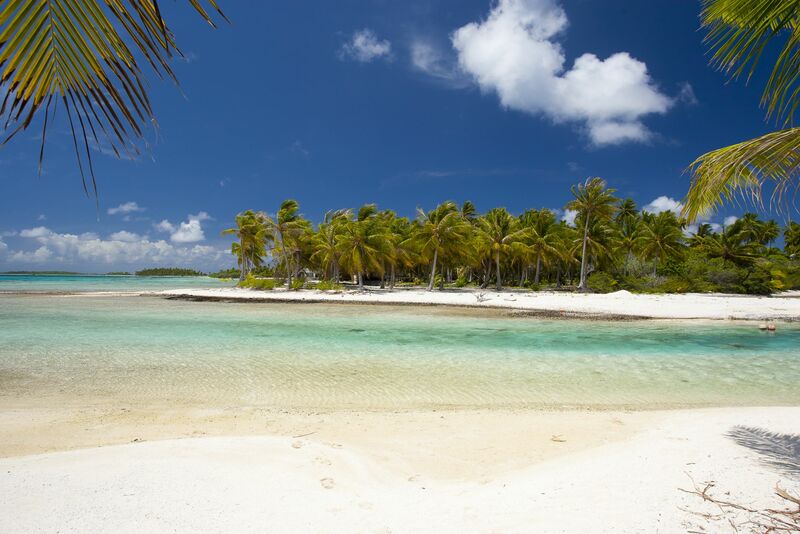 Beautiful planted with white coral sand beaches develop on the lagoon side . In between, spaces of varying widths define islands called "motu", planted with native vegetation and vast coconut plantations . Born out of coral, outcropping just enough to create the most mythical lagoons of the planet, these islands are the magnets that attract divers and Robinsons looking for a thrill. A rich and colorful marine life (among 350 species of coral) awaits you, while on the surface the infinite sky, the quiet, the postcard paradise… appear before your eyes. Reserved but cheerful and welcoming, it is simply that the people in the Tuamotu share with their visitors their daily lives and the exclusive beauty of their islands. Whether it's organizing a boat drive in the lagoon, a picnic on a remote motu, visiting exceptional places, their effectiveness is only matched by their kindness. Having acquired over generations the knowledge and practices enabling them to perfectly fit in this both wonderful and harsh natural environment, they know how to manage a pace and lifestyle that fits perfectly to the surroundings and are often for the traveler a puzzling philosophical example.